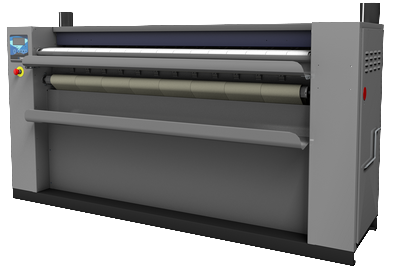 The range of DII ironers ø 325 mm is available in several useful lengths and 2 types of heating which allow it to be flexible and adapt to all types of structures. Its productivity between 10 and 40 kg / h is a pledge of satisfaction for customers. Dries et irons flat linen directly from a high speed spin washer extractor in a single operation. Electronic control: ironing speed and temperature selection. Roll Ø 325 mm in polished steel. Working width 1m40, 1m60 and 2m. Feeding and ironing by Nomex belts for a better quality of ironing and durability. SMART SYSTEM : automatic regulation of the ironing speed according to the residual moisture of the linen; energy economizer.